Boxing video: Baysangurov vs. Shabani post-fight press conference We offer your attention some extracts of post-fight press conference video after main event of «World Boxing in Zaporizhia. 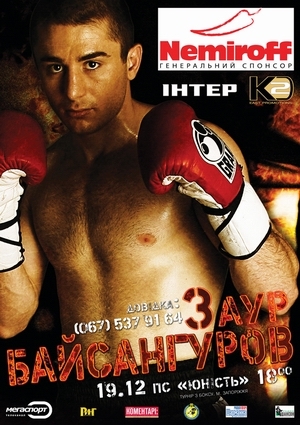 Champions league» fight card held by «K2 East Promotions» promotional company of Klitschko brothers in Zaporizhia, on December 19th. WBA Inter-Continental light middleweight champion Zaurbek Baysangurov (23-1, 17 KOs) retained his title by fifth round TKO against Frank Shabani (18-2-0, 6 КОs). Q&A: Dmitrij Nikulin. «I think I shall have to sweat hard for the victory» On this coming Saturday, December 19th unbeaten Ukrainian light middleweight Dmitrij Nikulin (19-0-0, 5 КОs) will claim his first title in a clash against tough Uzbek fighter Abdulaziz Matazimov (10-3-0, 4 КОs). Both with fight for vacant WBO European light middleweight title. On the eve of his most important bout in boxing career Dmitrij Nikulin spoke with us dwelling upon his training camp, his tactics for the fight as well as shared his opinion about Abdulaziz Matazimov.